Bradley Wiggins’ hour record attempt could happen in July or August of next year, according to the Diario de Mallorca newspaper. The paper also reported that Wiggins would make his hour record attempt at the El Palma Arena in Mallorca. Wiggins has spent the past few weeks in Mallorca and met with the velodrome’s technical director Joan Llaneras at the Tolo restaurant in Port de Pollença a week ago. The meeting between the two happened during a celebration hosted by the ex-footballer Tomeu Llompart. “Wiggins wants to break the record of the time in Mallorca in Palma Arena and fill the public velodrome. And he is convinced that this will mobilize thousands of English fans to travel on holiday to the island to see his attempt," Llompart told the newspaper. “He considers Mallorca as his home and therefore wants to face the record on the island." Any thoughts on the bolded part above? Not quite sure what this has to do with the Hour record though. The El Palma Arena velodrome is owned by the Mallorcan government and was the subject of an enquiry after it was linked with the embezzlement of public funds, forgery and bribery. http://www.cyclingnews.com/news/news-shorts-wiggins-to-attempt-hour-record-next-summerAny thoughts on the bolded part above? But as Dim said in the Brändle Hour livechat, Wiggins would most probably do his attempt on a track. Maybe he just met with Llaneras (a retired track cyclist) to talk about old times. 10 mins left: pace dropped slightly. 47.5km + about half a lap. I don't understand a word of Polish, but the commentator seems both excitable and repetitive. the commentator seems both excitable and repetitive. 1 can hope he goes all Rominger on it. While the hour record has become a new focus for several riders in the professional peloton, Belgian journalist Ruben Van Gucht has decided to make his own attempt on the record which was recently set at 51.850km by IAM Cycling's Matthias Brändle. Van Gucht will make his attempt on November 21 at the Flemish Cycling Centre Eddy Merckx in Ghent and has been training with help from Tom Boonen and Tom Steels. Van Gucht tweeted that he is expecting to ride between 38-40 kilometres. If you expect to ride 13 km short of the current Hour Record, that's not an "attempt at the Hour Record". That's just riding laps of a track for 60 minutes. 38-40km is nothing special at all on a TT rig with deep wheels. Is this guy doing it for a documentary or segment for Sporza to show the everyday punter how hard it is? Dekker having a shot is a bit of a laugh, I think he'll struggle with Jens' mark, let alone Brändle's. ...and I seriously doubt that Sporza guy is. One big issue in recent monhts has been the Hour Record. Bradley Wiggins has already made it clear that he will make an attempt next summer. However, he may have to battle against Martin who is also considering giving it a try. "That's on my agenda and I will discuss with my team in December how we can approach this issue without compromising my goals on the road," he said. "That is an essential factor: I need to find a time and a way of preparation which does not affect my road shape. I am surrounded by capable people and I have a team that supports me. So I think that we will find a date, preferably already in the coming year." If time allows, I'm ready for it," he confirmed his ambition to make an attempt in 2015. One disadvantage for Martin is the fact that he doesn't have Wiggins' experience on the track. "In the beginning, his advantage is infinitely big due to his experience on the track," he said about Wiggins. "He comes from the track - no one is better than him. Luckily, I have also been educated there at the youth level and I feel good there but I definitely need longer time to adapt. I will probably need two, three or four attempt to beat the mark that he is likely to set. But I want to work in that direction and after the first training sessions on the track, I can say whether it is realistic or not." Van Gucht will make his attempt on November 21 at the Flemish Cycling Centre Eddy Merckx in Ghent and has been training with help from Tom Boonen and Tom Steels. Van Gucht tweeted that he is expecting to ride between 38-40 kilometres." In other news, the UCI has just released a short list of other riders who may also be interested in the Hour Record. 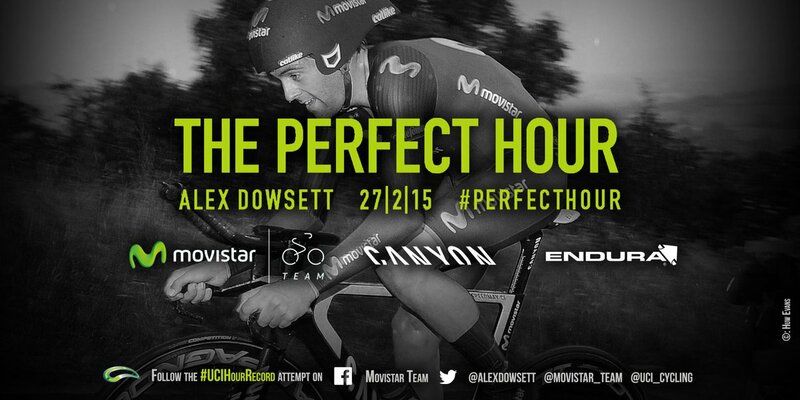 Alex Dowsett and his Movistar team today announced the rider’s plan to break the UCI hour record on February 27. Both Jack Bobridge and Rohan Dennis have announced that they will aim for the record. Bobridge’s bid will take place in Melbourne’s DISC velodrome on January 31, while Dennis will make his attempt in Grenchen, Switzerland on February 8. Dowsett’s attempt will come 19 days after the latter bid. This means that he isn’t yet aware what distance he will have to travel to break the record, but he will continue working hard in the meantime. A total of 6,000 places are available for those who want to be present at the bid, and can be purchased here. A total of 6,000 places are available for those who want to attempt the Hour record themselves. All three of Dowsett, Dennis & Bobridge are of a considerably higher calibre then what we have had till now.. Assuredly the opportunity to get your name in the records books once and for all is quickly fading and now the real specialists are getting involved. Particularly, Bobridge & Dennis as two of the best TP riders in recent history will be especially competitive, if Dowsett is in good form then he may well come very close to either of those distances. The Hour record is considerably longer than the higher intensity TP and so I wonder how Bobridge will fare, as he is up there as the best IP rider in the world. Definitely of benefit for the Australians to get their attempt done with in the Australian summer. Not sure Dowsett is any better than Brandle to be honest. Dennis will set the best time of the three. Then it will be smashed in the summer.